This is the tenth in a series of comic book reviews that will look at the direction of Marvel’s shared universe (particularly their “Avengers” franchise) over the past five or so years, as they’ve been attempting to position the property at the heart of their fictional universe. With The Avengers planned for a cinematic release in 2012, I thought I’d bring myself up to speed by taking a look at Marvel’s tangled web of continuity. Perhaps it was the novelty of Marvel’s Annihilation crossover which lent the series its appeal. It took some of the more often overlooked space heroes of the Marvel Universe and tied them all together as part of a gripping narrative fighting against the extinction of life itself. It was loud and bright and colourful and frentic – it was perhaps the best crossover that Marvel have produced in the past five years or so. So I was very much anticipating the sequel, Annihilation: Conquest – hoping that it could be another breath of fresh air in this long trek through Marvel’s shared universe. Unfortunately, it seemed that a lot of energy of the original was gone – the series couldn’t help but feel somewhat anti-climactic. This is the seventh in a series of comic book reviews that will look at the direction of Marvel’s core continuity (and in particular their “Avengers” franchise) over the past five or so years, as they’ve been attempting to position the property at the heart of their fictional universe. With The Avengers planned for a cinematic release in 2012, I thought I’d bring myself up to speed by taking a look at Marvel’s tangled web of continuity. 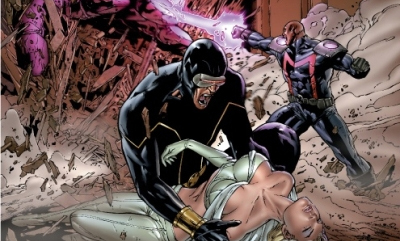 It has been commonly accepted that the “golden days” of X-Men crossovers are behind us. Of course, “golden days” is a subjective term – for every Age of Apocalypse, there was an Onslaught Saga – but there’s no way to argue that the mutants didn’t dominate Marvel’s output in the nineties. One would have thought that with Bryan Singer’s X-Men helping give birth to the superhero genre, this past decade might have been an even better one for the franchise, but it was not to be. In fact, The Avengers seem to have replaced the X-Men as the engine driving Marvel’s storytelling universe. Some might suggest that it is so blatant that it looks intentional (prompting a movie-related “conspiracy theory”), although Marvel have casually denied it – with vice president Tom Brevoort stating “these things tend to go in waves”. However, Messiah Complex is the first of a series of crossovers with the X-Men titles following House of Mwhich would chart the franchise’s gradual return to the status quo.